Oil refineries are closing all accross the United States with nearly half the refining capacity on the U.S. east coast set to disappear …so of course it’s no wonder gasoline prices are pushing all time record prices. 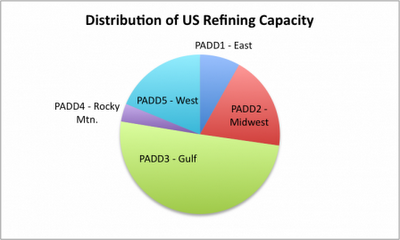 We now have half the refining capacity on the U.S. east coast set to disappear. Sunoco has pulled the plug on two refineries and warns that another in Philadelphia will close in July if no buyer steps forward while ConocoPhillips is trying to sell a refinery in Pennsylvania, idle since last year. So, what happened to get us here? Washington has floated predictable responses: drill more, punish speculators and work harder towards energy self-sufficiency. Ok, so what about refining the oil? The last major brand new U.S. refinery started operating in 1977 at Garyville, Louisiana. Since then, distillation capacity expansions have come from construction of relatively small refineries and expansion of existing plants. 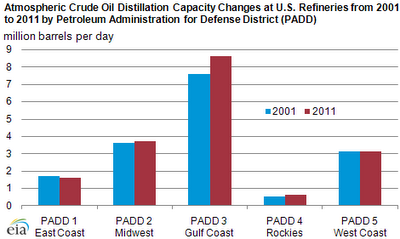 Decreases in refinery distillation capacity resulted mostly from plants that were shut down. In recent years, some refineries have temporarily ceased operation for economic reasons but continue to be counted as operable capacity if they can be returned to service within 30 days. U.S. petroleum demand has fallen steadily since 2007 as cars became more fuel-efficient, fuel marketers blended more corn-based ethanol into their product and high unemployment kept highway travel light. This put refineries between high input costs and a poor appetite for their fuel. “The downstream industry is the flywheel in the oil system,” says Kevin Lindemer, an oil industry consultant. “Right now we’re seeing big changes on both sides of the flywheel.” It will be interesting to see how this all turns out. Below is a list of the worlds largest Oil Refineries….